Citation: Amorha KC, Jiburu EM, Okonta MJ, Nduka SO. Cigarette Smoking Prevalence and Awareness amongst Undergraduate Students of the University of Nigeria, Nsukka. J Basic Clin Pharma 2017;8:239-244. Context: Smoking incidence among youths in Nigeria is on the rise and cigarette smoking is considered one of the largest causes of preventable morbidity and mortality globally. Aims: To assess the prevalence and awareness of cigarette smoking amongst undergraduates of the University of Nigeria, Nsukka. Settings and Design: This study was a cross-sectional and descriptive survey conducted among undergraduates in the University of Nigeria, Nsukka from June to August 2016. Methods and Material: Data were collected by the 44-item structured, self-administered questionnaire. Statistical Analysis used: The data were analyzed using the Statistical Package for Social Sciences (SPSS) for Windows version 16.0 (SPSS Inc, Version 16.0, Chicago, USA). P-value ≤ 0.05 was considered statistically significant. Results: A total of 570 questionnaires were completed and returned. Only 49.6% of the students had adequate knowledge of cigarette smoking and its health implications while the same percentage had good attitudes (i.e., attitudes that could make them never smoke or quit smoking) towards cigarette smoking. Of the 180 students who claimed to have smoked cigarette before, one-fifth smoked on a daily basis. More students who resided off-campus had smoked cigarette before (36.5%) compared to those in hostels (25.7%) (χ2=7.594; df=1; P=0.006). Conclusion: Approximately half of the respondents had good knowledge about cigarette smoking and its health implications. More than a fifth of the respondents had smoked cigarette before. Students who resided off campus exhibited a greater tendency to start smoking compared to those who resided in hostels on campus. Peer pressure and close associations could influence cigarette smoking habits. The general objective of the study was to evaluate the prevalence and awareness of cigarette smoking amongst undergraduates of the University of Nigeria, Nsukka. The specific objectives were: (i) To determine the prevalence of cigarette smoking among undergraduates (ii) To assess the level of knowledge of students as regards cigarettes, risks of cigarette smoking and its control (iii) To assess the attitudes of undergraduates towards cigarette smoking (iv) To determine the difference between demographic variables in their mean, knowledge and attitude scores (v) To evaluate the association between demographic variables and the knowledge, attitudes towards cigarette smoking. This study was a descriptive cross sectional study conducted within a duration of three (3) months, (June to August 2016), to assess the prevalence and awareness of cigarette smoking amongst undergraduates of the University of Nigeria, Nsukka. The University of Nigeria Nsukka, (Nsukka Campus) is located on 871 hectares of hilly savannah in the town of Nsukka about eighty kilometers north of Enugu State. In 2015 the student population was 15,439, comprising 8,690 males and 6,749 females. The Nsukka Campus houses the faculties of Arts, Agriculture, Biological Sciences, Education, Engineering, Pharmaceutical Sciences, Physical Sciences, Social Sciences and Veterinary Medicine, as well as Postgraduate programs. The study participants were second to final year undergraduate students of the University of Nigeria, Nsukka Campus, willing and able to participate. First year students, as well as students and members of staff of the University of Nigeria Enugu Campus (UNEC) were excluded from the study. The total population for the sample size was sought from the Department of Academic Planning Unit of the University of Nigeria, Nsukka. There were 10,849 undergraduate students, with 4,748 females. From this population the sample size was determined using the Raosoft® sample size calculator to be at 372 at 95% confidence interval and 5% margin of error, assuming 50% of the participants responded. The multistage sampling method was utilized. For convenience of sampling, the sample size was increased to 1000. In the first stage, stratified random sampling was used to determine the number of male and female students to participate. This number was further stratified into various departments in each faculty. Then simple random sampling was used to select the participants in the various levels in each department in the various faculties. Before the questionnaires were distributed, both oral and written consents were obtained from the study participants. A 44-item wellstructured self-administered questionnaire was disseminated to participants to assess demographic information, awareness, prevalence as well as their attitude towards cigarette smoking. To ensure quality of the data, questions were adapted from previously conducted studies and changes made based on the local context. The questionnaire was validated from the responses of the respondents who were not included in the study. The selected participants filled the questionnaire in their classes within 10 minutes, without the consultation of any reference material. Confidentiality was maintained as the names of the respondents were not requested for. Data were coded and analyzed using the Statistical Package for Social sciences (SPSS) for Windows version 16.0 (SPSS Inc, Version 16.0, Chicago, USA). Descriptive statistics were used to summarize data. The independent t-test and analysis of variance (ANOVA) were utilized to determine the differences between the demographic variables in their mean knowledge and attitude scores. The Pearson chi-square test and Pearson correlation test were used, where applicable, to show the association and relationship between variables. For all results p-value ≤ 0.05 was considered statistically significant. A total of five hundred and seventy questionnaires were completed and returned, representing a participation rate of 57.0% (570/1000). Majority of the respondents were males (62.8%), between the ages of 21-25 years (52.7%), Nigerian (99.3%), Christian (97.2%) with more than half residing off-campus (55.2%). About 44.2% had friends who smoke and many grew up in South-Eastern Nigeria (68.8%) [Table 1]. In general, only 49.6% of the students had good knowledge of cigarette, cigarette smoking and its health implications [Table 2]. About 49.6% of the respondents had attitudes (classified as ‘good’) that could make them never smoke or quit smoking cigarettes [Table 3]. 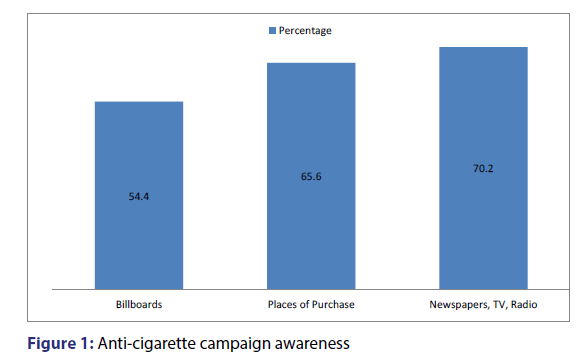 A proportionately much larger number of respondents (70.2%) noticed anti-cigarette campaigns in newspapers, TV or radio [Figure 1]. About 31.6% of the respondents had smoked a cigarette before, even if it meant trying a few puffs once or twice. Of this percentage, 12.8% had smoked in the last month while only 6.3% smoked cigarette daily [Table 4]. In Table 5, more female students had good attitudes towards cigarette smoking (i.e., would never start smoking cigarettes or those who smoke were more likely to quit smoking) compared to their male counterparts. Students who resided off-campus had better knowledge scores on cigarette smoking than those who resided in hostels. Students who had neither smoking fathers nor smoking siblings/friends had better attitudes towards cigarette smoking (i.e., would never start smoking cigarettes or those who smoke are more likely to quit smoking) than those who did. Table 2: Knowledge on Cigarette Smoking. How many sticks of cigarette do you smoke per day? At what age (in years) did you take your first puff? What were your reasons for trying to quit? Although the one-way ANOVA showed a significant difference between the mean scores on knowledge for the different faculties, the Post-Hoc multiple comparisons with Scheffe did not show the pattern of the difference between the Faculties. There was also a significant difference between the mean attitude scores for the different faculties and the Post-Hoc multiple comparisons with Scheffe showed a significant difference between: Biological sciences students and Physical Sciences students (P<0.001); Biological Sciences and Social Sciences students (P=0.026); Physical Sciences and Education (P=0.032). Biological Sciences had better attitudes than Physical Sciences and Social Sciences while the Physical Sciences had better attitudes than Education. Furthermore, there was a significant difference in the mean knowledge scores between the different age groups. The Post-Hoc multiple comparisons with Scheffe showed that those between 21-25 years had better knowledge than those aged 16 -20 years (P = 0.019). Although there was a significant difference between the mean knowledge scores for the different regions for childhood upbringing, the Post-Hoc multiple comparisons with Scheffe did not show the pattern of the difference between the regions. Tables 6 shows that a proportionately much larger number of students who reside off-campus had better knowledge on cigarette smoking (53.8%) compared to those who reside in the hostel (on-campus) (45.1%). A proportionately much larger number of female students had better attitudes towards cigarette smoking (57.1%) compared to their male counterparts (45.3%). Also, those who resided in the hostels had better attitudes towards cigarette smoking (54.5%) compared to those who resided off-campus (45.8%). Furthermore, a proportionately larger number of students with fathers who did smoke had good attitudes towards cigarette smoking (51.3%) compared to those with fathers who smoke (33.3%). Students who did not have smoking siblings had better attitudes towards cigarette smoking (52.1%) than those with smoking siblings (22.9%). Also, those who did not have smoking friends had better attitudes towards cigarette smoking (58.5%) compared to those who had smoking friends (38.5%). Those in Pharmacy (61.2%) and Veterinary Medicine (67.9%) had adequate knowledge about cigarette smoking compared to other faculties. More students in Biological sciences (66.7%) had good attitudes towards cigarette smoking compared to other faculties. About half of the students had adequate knowledge of cigarette, cigarette smoking and its implications and just half of them had bad attitudes towards smoking (i.e., attitudes that could make them start smoking or not quit smoking cigarettes). More than a fifth of the respondents had smoked cigarette before, even if it meant trying a few puffs once or twice. Of this, about a tenth had smoked in the last month and less smoked cigarette daily. Students who resided off campus exhibited a greater tendency to start smoking compared to those who resided in hostels on campus. Peer pressure and close associations could influence cigarette smoking habits. Knowledge scores were summed up to give the total knowledge score for each respondent. Knowledge scores ranged from 0 (minimum) to 10 (maximum). These knowledge scores were categorized such that those who scored above the median 6 of the total knowledge scores had adequate knowledge of cigarette smoking. Also, the attitude scores were summed to give the total attitude score for each respondent with range from 0 (minimum) to 11 (maximum). Respondents who had above the median (7) of the total attitude scores were categorized as having good attitude. The prevalence of smoking was categorized to avoid respondents denying the habit. Of the total number of students who claimed to have smoked cigarette before, about 40% had smoked cigarette in the past month while one-fifth smoke on a daily basis, mostly 1-5 sticks. This was a lot higher than the relatively low prevalence of current cigarette smoking among medical students in Lagos. Most of the respondents took their first puff between the ages of 12 and 18 when they must have been in secondary school. Adolescents/youths are very prone to peer pressure which can significantly influence their tobacco use. [4,13] The influence of friends extends to university years as one of the major reasons in this study for smoking cigarettes was because friends smoke. Some students who smoke occasionally believe they are immune to the health risks of smoking. It is important to highlight the after-effects of occasional smoking to these ones, before nicotine dependence sets in. Light and intermittent smokers do not like to be labelled as smokers and often deny their habit and may go undetected if the questions posed to them are not appropriately phrased. [14,15] A study in an American College showed that non-daily and daily smokers reported mostly similar health risk behaviors. Even stable light smoking has notable health risks and is not a healthy long-term choice. Students who are passive smokers should be encouraged to quit completely. Counseling by health professionals was the least reason why the respondents had tried to stop smoking suggesting that health professionals may not be actively involved with this. Community pharmacists are well positioned to assist those willing to cease smoking. Counseling and medication can more than double the chance that a smoker who tries to quit smoking will succeed. Seminars/workshops could be conducted on campuses to enlighten students on the hazards of cigarette smoking. In an evaluation of students in a Nigerian city, those who had received lectures on smoking were significantly willing to quit compared with those who had not received such lectures. Lectures could be delivered on public advocacy days to draw awareness e.g., World No Tobacco Day. More than half of the females had more likelihood of quitting/ never starting smoking. This could be attributed to the greater social disapproval of women who smoke and greater social pressure to quit. [4,23] More female students had better attitudes than their male counterparts towards smoking. This finding is similar to a study done in Cross River State, Nigeria. Ladies less likely smoke in public places in Nigeria. Students who resided on campus had better attitudes towards smoking compared to those who stayed off-campus. This could be due to more exposure off-campus. Students who reside off-campus have more liberty with greater access to stores where cigarettes are sold. This study only included students from the University of Nigeria Nsukka and the results might not be generalized to the whole student population or other universities. The information was collected by self-reports, hence the possibility of response bias. Cigarette smoking is commonly perceived as a bad habit so students who smoke might have reported otherwise due to social desirability. Furthermore, since there were more undergraduate males, the prevalence of cigarette smoking may have been higher since males are more likely to smoke than females. Some students were unwilling to participate in the study due to their on-going exams. This study revealed that undergraduate students are more likely to smoke cigarettes when they reside off-campus. Also, peer pressure and close associations could influence cigarette smoking activities. Hence, more male hostels should be available on campus. Seminars/workshops should be conducted on campuses to enlighten students on the hazards of cigarette smoking. Lectures could be delivered on public advocacy days to draw awareness. Students who resided off campus were more likely to start smoking compared to those who resided in hostels on campus. Peer pressure and close associations could influence cigarette smoking habits. Emerole CAJ, Chineke HN, Diwe KC, Onubeze DPM. Prevalence of smoking among undergraduates of Imo State University Owerri, South Eastern Nigeria. Niger J Gen Pract 2013;11:43-7. Ukwayi JK, Eja OF, Unwanede CC. Peer pressure and tobacco smoking among undergraduate students of the University of Calabar, Cross River State. Higher Education Studies 2012;2:92-101. Egbe CO, Egbochukwu EO, Petersen I, Meyer-Weitz A. Cigarette smoking among Southern Nigeria youth and what geopolitical zones got to do with it. Vulnerable Children Youth Stud 2016;1-12. Saravanan C, Heidhy I. Psychological problems and psychosocial predictors of cigarette smoking behavior among undergraduate students in Malaysia. Asian Pac J Cancer Prev 2014;15:7629-34. Umaru Y, Abdullahi MI, Oliagba O, Sambo S, Abdulwahid U. The effect of cognitive restructuring intervention on tobacco smoking among adolescents in Senior Secondary School in Zaria Kaduna State, Nigeria. Eur Sci J 2014;10:327-36. Egbe CO, Petersen I, Meyer-Weitz A. Knowledge of the negative effects of cigarette smoking on health and well-being among Southern Nigerian Youth. International Journal of Social Science and Humanity 2016;6:184-90. Helweg-Larsen M, Tobias MR, Cerban BM. Risk perception and moralization among smokers in the US and Denmark: A qualitative approach. Br J Health Psychol 2010;15:871-86. Dania MG, Ozoh OB, Bandele EO. Smoking habits, awareness of risks, and attitude towards tobacco control policies among medical students in Lagos, Nigeria. Ann Afr Med 2015;14:1-7. Adebiyi AO, Faseru B, Sangowawa AO, Owoaje ET. Tobacco use amongst out of school adolescents in a local government area in Nigeria. Subst Abuse Treat Prev Policy 2010;5:24. Brown AE, Carpenter MJ, Sutfin EL. Occasional smoking in college who, what, when and why? Addict Behav 2011;46:1199-204. Waters K, Harris K, Hall S, Nazir N, Waigandt A. Characteristics of social smoking among college students. J Am Coll. Health 2006;55:133-9. Sutfin EL, McCoy TP, Berg CJ, Champion H, Helme DW, O’Brien MC, et al. Tobacco use by college students: a comparison of daily and nondaily smokers. Am J Health Behav 2012;36:218-29. Abikoye GE, Kashimawo AJ, Eze CU. Tobacco smoking and awareness of smoking-cessation products in a university community. J Public Health Epidemiol 2013; 5:351-86. Atoyebi OA, Ibirongbe DO, Babatunde OA, Atoyebi OE. To start and quit smoking cigarettes: an evaluation of students in a Nigerian city. J Prev Med Hyg 2013;54:104-8. Eniojukan JF, Owonaro PA. Tobacco use awareness and perception among medical students in the Niger Delta University, Bayelsa State, Nigeria. European Journal of Pharmaceutical and Medical Research 2016;3:12-7. Cohen JE, Planinac L, Lavack A, Robinson D, O’Connor S, DiNardo J. Changes in retail tobacco promotions in a cohort of stores before, during, and after a tobacco product display ban. Am J Public Health 2011;101:1879-81. Spanopoulos D, Britton J, McNeill A, Ratschen E, Szatkowski L. Tobacco display and brand communication at the point of sale: implications for adolescent smoking behaviour. Tob Control 2014;23:64-9. Kim AE, Nonnemaker JM, Loomis BR, Shafer PR, Shaikh A, Hill E, et al. Influence of tobacco displays and ads on youth: a virtual store experiment. Pediatrics 2013;131:e88-e95. Greaves L. The meanings of smoking to women and their implications for cessation. Int J Environ Res Public Health 2015;12:1449-65.